When it comes time to choose a refrigerated warehouse technician, Danvers business owners should come to United Service Co. We’ve been in business since 1953 in New England, and we have more than a century of combined experience amongst our technicians. Refrigerated warehouses are one of our specialties. We understand the intricate processes and systems that keep these facilities in proper working order. Our team can help you build, maintain, and optimize your refrigerated warehouse in no time. Learn more about us. For new installations. Curious about installing a new refrigerated warehouse system or some other piece of commercial equipment? United Service Co. handles sales and new installations thanks to our experienced technicians. We offer a wide range of competitively priced equipment items for purchase. Before something goes wrong. We can schedule quarterly maintenance services to inspect your refrigerated warehouse and make any necessary repairs. Maintenance includes cleaning, component lubrication, and replacing any worn parts to keep your warehouse in optimal working condition. You suspect something is wrong. If you notice any unexplained temperature changes, odd noises, or other issues with your refrigerated warehouse, technicians in Danvers should be on-site as soon as possible. Delaying repairs when you notice something is amiss can result in full-blown breakdowns and costly repairs. Your energy bills don’t seem right. It takes a lot of energy to keep a refrigerated warehouse the proper temperature at all times. The efficiency of your system can greatly affect your monthly utility bills. If you notice a sudden increase in your electric costs, your refrigeration system might be experiencing problems. You have questions about your system. Sometimes it’s worthwhile to call a refrigerated warehouse technician in Danvers for a chat. At United Service Co., we welcome frequently asked questions and concerns regarding your refrigeration system. Our friendly staff is happy to discuss your system in detail with you. In an emergency. A total breakdown can be disastrous for a refrigerated warehouse business. It could lead to ruined items, code violations, and lost business. Prepare for this catastrophe by keeping a trusted refrigerated warehouse technician in Danvers on speed dial. Save our contact information We provide 24/7 emergency repair services. As the owner or manager of a refrigerated warehouse, it is your responsibility to keep your system up and running without a hitch. Even a minor issue with your refrigeration unit can lead to a widespread power outage or other major issue. Tackle common problems before they occur with help from our knowledgeable refrigerated warehouse technicians in Danvers. United Service Co. is the go-to local source for all things commercial and industrial equipment. Why Choose Our Refrigerated Warehouse Technicians in Danvers? Selecting your refrigerated warehouse technician in Danvers isn’t easy. You must consider the company’s history, reviews, prices, and a dozen other aspects before you make your decision. For a system as large, expensive, and important as a refrigerated warehouse, you want to trust only the best in the business. United Service Co. is your answer. Read the full reviews. Our company has always prioritized customer service – something that shines through in our many positive customer testimonials and five-star ratings. We take pride in old-school customer service, craftsmanship, and plain good business. Our refrigerated warehouse technicians in Danvers offer prompt and professional services at every customer call. Our commitment to you is total customer satisfaction – we won’t settle for less and neither should you! There is no telling when or why you’ll need a refrigerated warehouse technician in Danvers. As the adage goes, “Hope for the best, but prepare for the worst.” Researching your ideal technician and service company ahead of time can make your life much easier should you experience a major problem in the future. Look at a breakdown as inevitable unless you schedule routine maintenance services. Only high-quality professional maintenance and inspections can ensure the optimal performance of your refrigeration system. 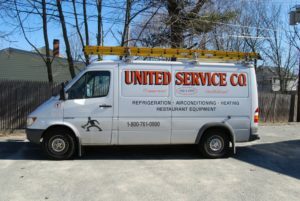 United Service Co. is a prized location in New England for all things commercial refrigeration, heating, and cooling. We offer award-winning services at competitive prices, as well as around-the-clock scheduling. We know you can’t plan on a disaster – so why should you wait for business hours to seek repairs? Our technicians will answer your emergency call 24 hours a day, seven days a week to get your warehouse up and running with minimal interruptions. Emergency response is just one thing our crew offers customers. No matter what you store inside your warehouse, you require seamless and dependable cooling. Our company can help you make this possible. Partner with United Service Co. to optimize your commercial or industrial appliances. You’ll gain access to an incredibly valuable resource in the area. To speak with an experienced refrigerated warehouse technician, Danvers residents can reach out online or call (800) 761-0900.